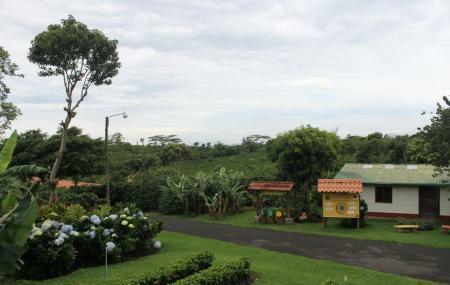 The Doka Estate is a coffee estate located on the slopes of Alajuela Poas Volcano. The coffee produced by the estate is one of Costa Rica's highest quality coffees. The rich soils of the volcanic slopes along with excellent climate contribute towards its taste. The estate belongs to Costa Rican Vargas Ruiz family and they are friendly enough to offer guided tours of their estate. ‘From the seed to the cup’ is their motto. The tour begins at the seedbed and ends at the tasting room and the souvenir shop. A must visit for coffee lovers. Do buy their coffee for yourself and for your loved ones. The estate offers different tour packages that may include pick up and drop, breakfast and lunch- depending upon the package you choose. Morning: 9:00 a.m., 10:00 a.m. and 11:00 a.m. Afternoon: 1:30 p.m., 2:30 p.m. and 3:30 p.m. Afternoon: 1:30 p.m. and 2:30 p.m.
Transportation by the estate in provided on request. Love this? Explore the entire list of places to visit in Alajuela before you plan your trip. Fancy a good night's sleep after a tiring day? Check out where to stay in Alajuela and book an accommodation of your choice. How popular is Doka Estate? People normally club together Souvenir Museum Verdes And Colores and Parroquia Virgen De La Asuncion while planning their visit to Doka Estate.